I never did actually post the details of how this table came to be. What!? We purchased a home back in 2010 with the perfect space for a vintage-style harvest table I'd been dreaming of for years. It was a long dining area right off the kitchen. 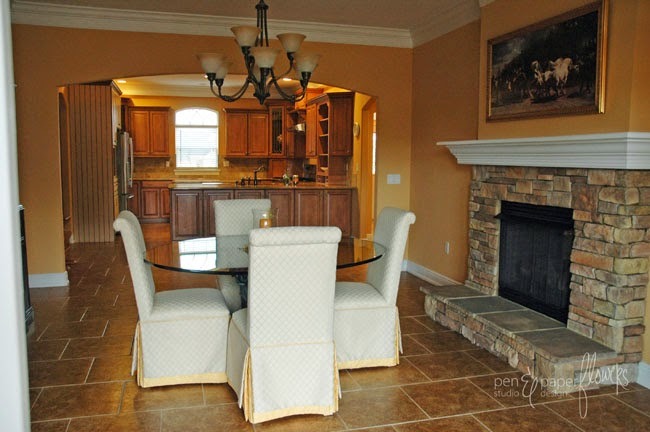 Here's a photo I took of the dining space as we were touring the home with our realtor. The round table was fine but it definitely didn't go with the space, in my opinion. In all fairness, I think the homeowner had moved most of her stuff out of the house already and just had a few things in the house to be able to show it for selling. She had already moved out so I'm sure this table wasn't really her preference for this room. At least I don't think so anyway. I'm giving her the benefit of the doubt. 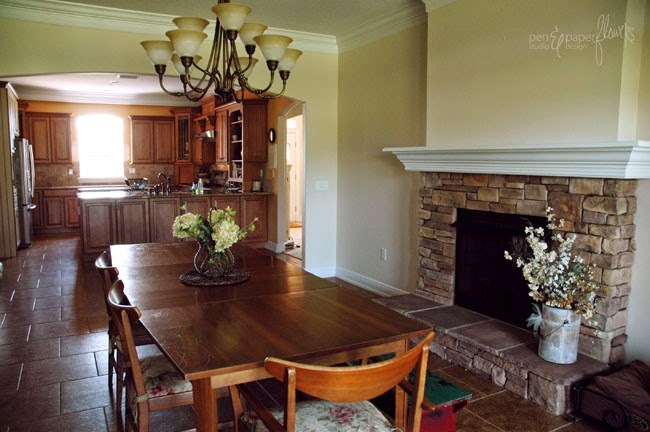 However, the paint color isn't something I can really justify for the previous homeowner - it is what it is. (or rather what is was…the paint was the first thing to go when we moved in). 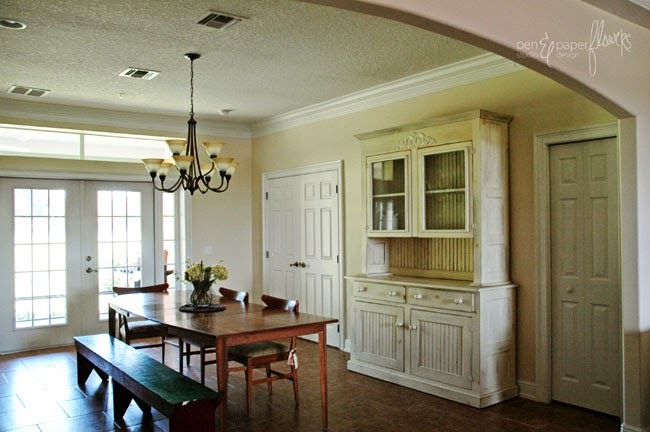 see the before and after paint photos HERE). The original table we used in the dining area when we first moved in actually belonged to my grandparents. (see below). It looked just fine in the space and I even used an antique bench I'd bought years ago on one side of it to get the feel of the farmhouse table I would eventually replace it with. My grandparent's table has a great deal of sentimental value to me since I lived with them for a significant portion of my life and this was the table I sat at as a child. I remember the table always being full of food and full of family. I could sit there for hours listening to stories, laughing and celebrating birthdays. It's a reminder of simpler times, that's for sure. In fact, writing this post conjures up an entire host of emotions. I miss my grandparents…and frankly, I miss those simpler times too. I wish my girls REALLY had the privilege of knowing them both. They were amazing people. With that said, as much as I love the sentimental value behind it, I'm not in love with the overall design. The middle of the table is actually wider than the ends, which is kind of cool, it's just not a table style I would've picked out. And the grains of wood of the extension pieces of the table don't flow with the main pieces of the table. I think you can see it in the photo below. 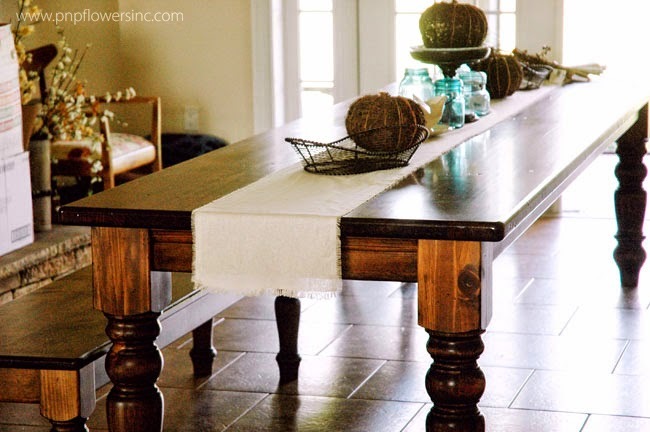 It's not a big deal if you keep a tablecloth on the table (which my grandmother did 99% of the time), but I like my wood exposed and the table looked best fully extended in this space. So the mismatched grains of wood really bothered me sometimes. Other times I didn't mind it all that much and and thought it just kind of added to the character of the table. 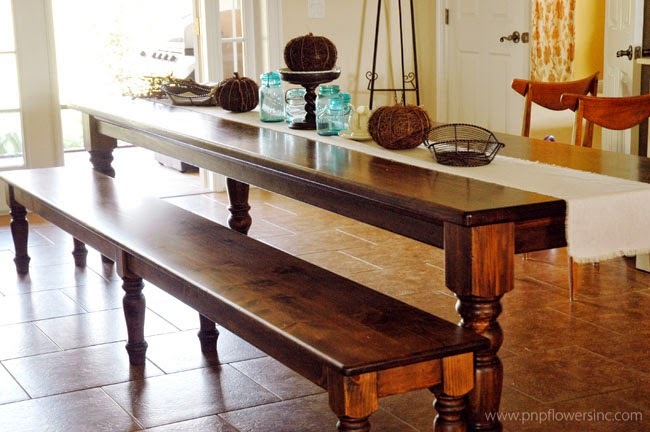 We purchased our home in March and we knew we were going to want to host Thanksgiving Dinner later that Fall, (see THIS post and THIS post too), so we knew a larger table was in order. 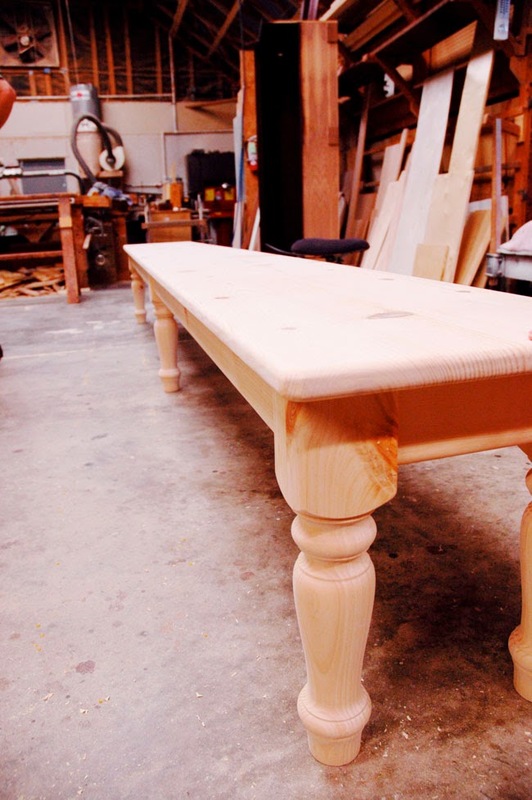 I commissioned the help of John's Custom Woodworks, a local woodshop business, and we started the process of designing and building a custom table and bench. I'd been obsessing over vintage farmhouse tables for sometime and I loved how some of the ones I'd found through the years at antique shops were super long and super skinny. I wanted the table to feel as authentic as possible so we went with a knotty pine wood and non-traditional table measurements: 11 feet long and 3 feet wide. (to put it in perspective, the extra large table dimensions of this Pottery Barn Table I love is still two feet shorter than our custom table and 1/2 a foot wider). 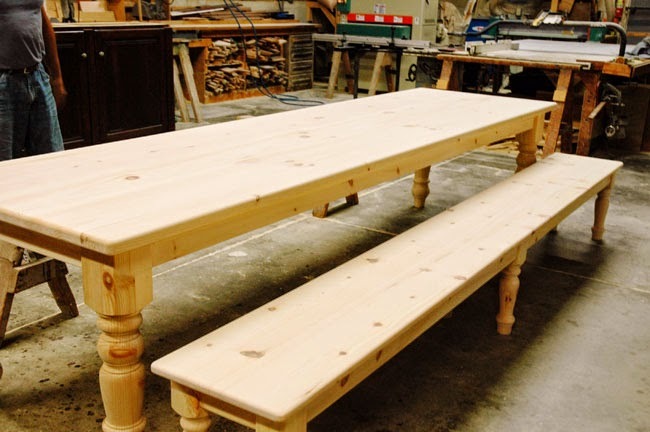 When the naked table and bench were finished we were called in to the woodshop to see it as well as select the stain we wanted. 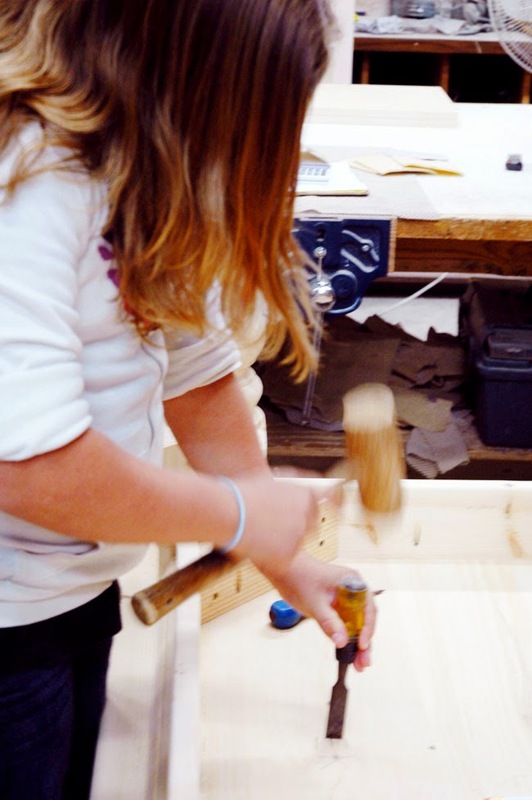 I was so excited to see it in the raw wood state…it was amazing to watch it come together. 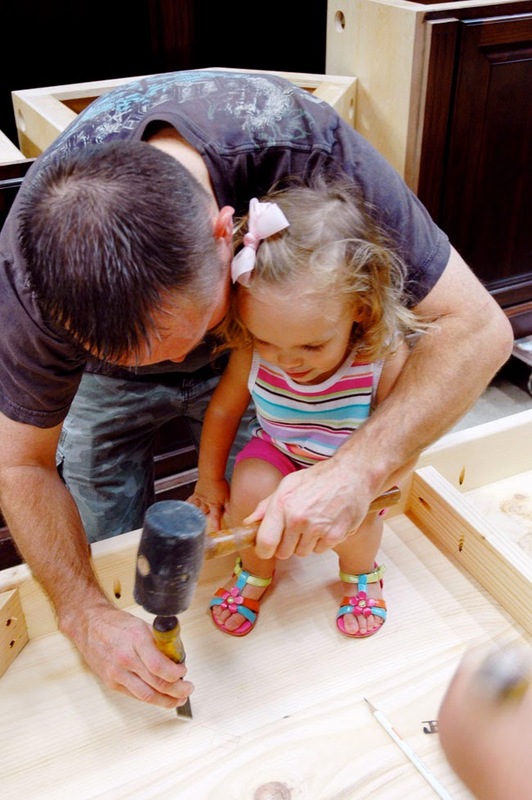 I had other plans that day too…aside from picking the stain. 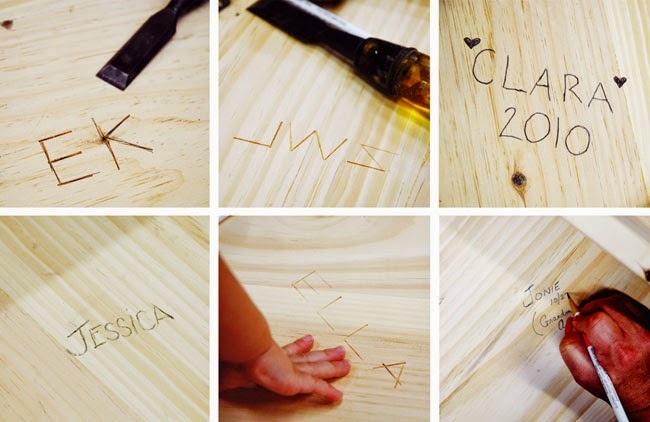 To REALLY make this table OURS, we flipped the table over right there in the shop and I had each of us carve/engrave our names or initials into the underside of the table. I think my family thought my request was strange but I think they appreciate the thought behind it now. Ema…age 11…working on her initials. 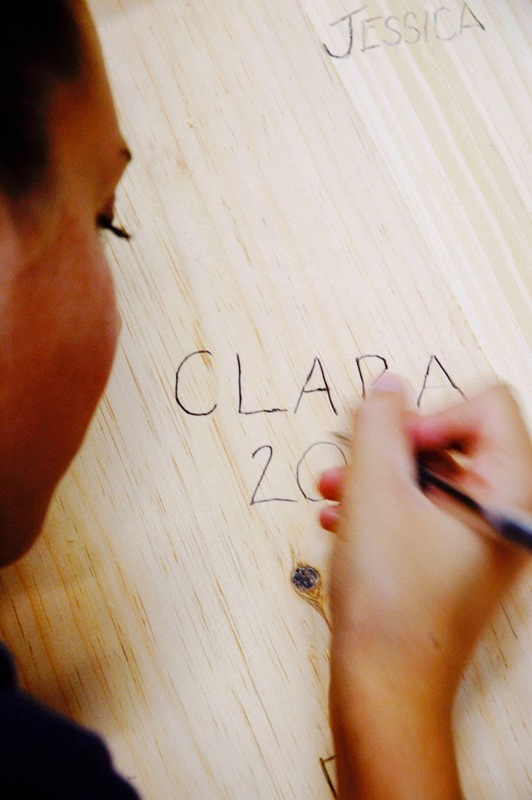 Clara, age 14, adding her name. And here it is…days after it was delivered and already with Thanksgiving Dinner decor on it. We've got the bench on one side and 4 years later I'm still looking for the perfect chairs for the other side. (I honestly haven't put any energy into finding some). We are still using the set of ladder back chairs we purchased off of Craig's List to make sure we had enough seating for Thanksgiving that year. We also still use two of the chairs from my grandparent's table. (the table has now been disassembled and is being stored in the garage). With seating for 14 we fit all of the adults at the table that year and the kids were able to sit outside at the "kids' table"! I LOVE my farmhouse table. It's one of my favorite places to be every night…having dinner with my family. We sit on one end of it - the end that happens to have our names underneath it. *wink* You'll also find me crafting at this table and packaging up The Pastry Pedestal. It can hold a good amount of laundry too! Ha!! The table isn't perfect. 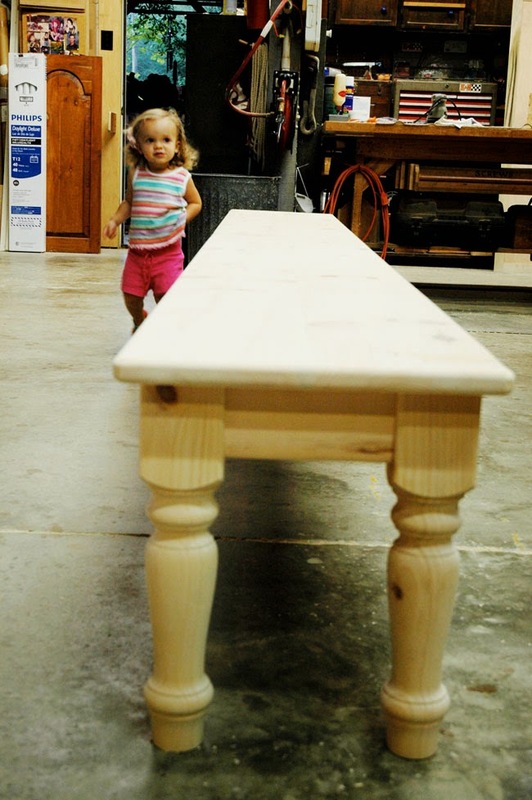 I couldn't bare to tell J for 2 years that the finish on the table didn't turn out how I wanted. I thought he might have a heart attack. I was wanting more of a "waxed" finish and this table ended up with more of a sheen/gloss to it - but only on the table top. The legs and bench are perfect. You see, when it was delivered, the wife of the gentleman who made it is the one who does the finishing for their business and she was there that day. She pulled me aside and let me know she thought it came out a little too glossy for my tastes but assured me the gloss would lose it's shine over time so I just kept my mouth shut. It's been almost 4 years and it still seems shiny to me! *frown* The thought of sanding it down to refinish it has crossed my mind more than a handful of times but I don't dare bring it up to J at this point. Regardless…I love our table. And I love all of the knicks and marks we've already worn into it. It feels lived in and loved on! And I like that!! I feel lucky to have the table I'd been dreaming of. And lucky to have such a beautiful, heirloom quality piece of furniture to pass down to my kids one day - with our initials and names engraved in it. Oh I love love your table! My so. And his wife just married last august and the first thing they bought off Craigslist was a farm table! They started an "around the table" ministry and they really enjoy filling it up! Blessings to you. I love your farmtable!! My son was married last August and one of their first purchases off Craigslist was a large farm table! They started an "around the table ministry" and serve dinner to neighbors on Monday night! I'm so proud of them! Love and joy. Gayla. Thanks for sharing with us! !